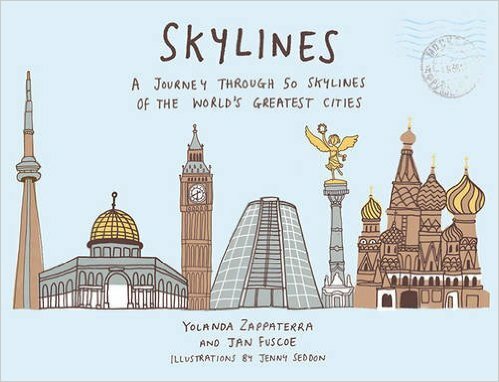 Just over a year ago, my friend, Yolanda, and I were asked if we’d like to write about architectural skylines around the world. Not just any old skylines; these would made out of our chosen buildings to create an imaginary skyline that would hopefully encapsulate the history, culture and heart of the cities we chose. It was an epic task. We first had to agree on categories – finally we nailed them down to ‘cultural’, ‘seaside’, ‘fortress’, ‘skyscraper’, ‘sacred’ and, our personal favourite, ‘visionary’. Then we had to choose the cities themselves. We started with cities we knew well – skyscraper Tokyo, cultural Genoa – expanding out to unmissable ones (Mecca, for sacred; Baku, for fortress). Finally, on to the fanciful (how about Timbuktu, for cultural, or the imaginary Utopia, for visionary?). Click for reviews from DesignCurial, Hidden Europe, and the Independent on Sunday. And here’s what the Cool Mom Picks website has to say.